Greetings. My name is Christopher Stevens, but I also go by the pen name of Christopher Galletta or CJS Galletta for short. I was born in May 1974, and I live in Upstate New York with my beautiful native Thai wife, Rungnapha, and my family. I am a freelance graphic artist and a seasonal florist at my family's seasonal greenhouse business, and I co-founded/co-own and race in a 5hp go-kart racing league. I created, illustrated, and colored all of the artwork found on the below websites, and I also built all of the below websites and wrote all of their contents (except for the Tee & Wee book store). Below are free, online samples of what I do best: Graphic Novel, Comic book, cartoon/comic strip, children's book, graphic novel and commercial artwork. 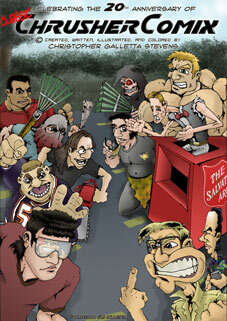 I pencil and/or ink all of these illustrations by hand, and digitally color (via Adobe Photoshop) since 2005. I am available for commissions on hand drawn artwork, computer art, and website design. I work for extremely affordable prices. My normal fees for commissioned work are as follows: $10-50 for banners, $50-300 for reproducible logos for your organization, $50-100 for HTML webpages, $50-100 for small cartoons, $50-300 for full-page comic book or graphic novel artwork (price will vary based on more detailed and/or colorized). More samples of my work are available online, and a lot of it for free. Just browse the below information. Thank you! 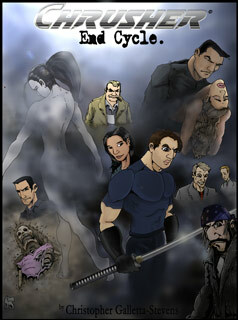 Currently being produced is the newest page of Chrusher: End Cycle, an online graphic novel. The cover on the left is the first page of the new graphic novel, and the cover on the right is the shortcut to the first page of "Classic Crusher Comics." A complete listing in chronological order is found here, and one is inverted-chronological order is found here. Created in 1988, when a 14-year old started drawing a made-up-on-the-spot comic book in his high school sketchbook during study hall. Twenty years and a handful of awards later, the entire forty-seven episode, one-thousand+ page series debuted online in 2005. This series was created before webcomics existed, was never previously published in print format, and was only web-published in its entirety recently, making it one of the best kept secrets of the comic world, & webcomic-cliché-free. Enjoy any of the dozens of storylines and thousands of pages today! All pages created, written, illustrated, colored, maintained, and © copyright by Christopher Galletta Stevens. This is a project that I co-created with a writer friend of mine named Robert Buchanan. 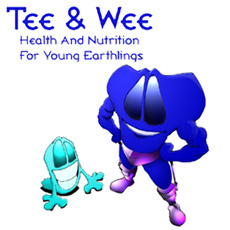 It's a children's book tentatively labeled Tee & Wee: Health and Nutrition. It's about two aliens who teach earth children how to eat and exercise to stay healthy. Robert proposed the idea and we co-collaborated on the design of the characters. Robert then wrote the story and I hand-penciled, inked, and digitally colored the entire book. I basically taught myself how to use Adobe Photoshop from scratch via coloring this book, and though it was a long process, I am delighted with the finished product. The book is now available for sale, and we are both very proud of this work and would be honored if you would buy a copy today! Founded in the early 1990s by my brother and I, we race racing modified yard karts on dirt and clay racetracks in the local area kart tracks. Racing with mostly 5 horsepower motors (gas-powered with 100% stock parts and shaved heads), we founded the Oswego County Gas Karting Points series, which we race at Galletta's Greenhouse Yard Kart Speedway since 1995 and at Oswego Speedway's dirt karting track since 2006. I own, designed, built, and run the website, which includes pictures, video clips, race descriptions, and statistics for every race since 2005. Generations of family have made Galletta's Greenhouse a successful small business. If in Oswego area between May and August, then please stop by for your flowers and planting needs. On one hand, I wouldn't mind doing political cartoons. But on the other hand, I know how intolerant and hateful some people can be when you disagree with them politically. Like the people whom these ones would offend. Here are some illustrations of some random pop culture characters from TV shows and movies that I loved when I was growing up. Mainly Star Wars and Transformers, both of which I owe a great deal of my childhood memories and imagination to. My objective with these was to try out for comic book companies with them. Here are some of my Star Wars illustrations. I can actually do better now, but they still aren't too shabby, especially the 1999 ones. The characters are all owned by Lucasfilm, obviously. Note: Most of these aren't colored, as I did them before I had a computer. However, the Darth Maul bust was colored by art marker and the background by Photoshop. Here are some illustrations of some popular Takara/Hasbro's Transformers: Generation One characters. I don't care for the modern day Transformers series; the cartoon by Sunbow/Marvel that aired from 1984-1987 (which are all available on DVD) was everything to me when I was a kid, and still admire them twenty years later. Note: Same as above, mostly uncolored because I didn't have a computer when I drew these. The colored Bumblebee, Hot Rod, Optimus Prime, and Megatron were colored years later using Corel Photo House before I learned how to use Adobe Photoshop. I could add more gradients and effects if I had used Photoshop, and did add a little. Please note that these Transformers were drawn prior to Dreamwave's fantastic meched-out Transformers comic books were out. If I drew them nowadays, I'd likely adopt some of the similar styles that they used. These illustrations were based more after the animated series and Movie that ran from 1984-1987, which I love to no end. In addition to Tee and Wee, Robert Buchanan also had me draw illustrations for a short story of his. But the project was placed on hiatus so we could tackle Tee and Wee. Here are a few pencilled and inked pages from "Sara: Stray" for your viewing pleasure. The text of this story is omitted and © copyright Robert Buchanan. If interested, here are Robert's blog, pictures, and Simpy websites. I started doing cartoons and comic books when I was a little kid as far back as I can remember. I was drawing Frosty the Snowman when I was barely old enough to walk. I made my first comic strip, Mr. Butts, when I was under ten years old and used to get in trouble in Elementary School doing them. In Middle School, I again got into more trouble than good with my practical joke comic strips mocking my friends and completely destroying some teachers that I didn't care for. By High School, the trend continued, as I continued to get in trouble for them. That was until the High School newspaper's editor/teacher spotted my art and instantly asked me to be on his art staff, where I stopped getting in trouble and started getting positive attention. I drew Crusher Comics and occasional news-related illustrations for Oswego High School's Buccaneer Bulletin from1989-1992and I have them here. I was proud to accomplish many accolades during this era, as I won The Empire State School Press Association's First Place Certificate for the Best Cartoon in New York State of the academic school year of 1989-1990.I also won First Place two times and Second Place one time for The Syracuse Newspapers High School Press Day's Editorial Writing/Cartoon Contests during the years of1990-1992, which has, to my knowledge, a streak that is unmatched before or since. I then took assorted cartooning and commercial art adult education classes during and after high school, and have a degree in cartooning/graphic art from Oswego. I've been writing & illustrating Chrusher Comics since 1988, and Towner comics from 1997, all without pay (other than the Towner cartoons that double as Galletta's ads in Oswego's Palladium Times newspaper every May. Thousands of samples of my illustrations are above. I have been art director, advertisement illustrator and co-website designer for Galletta's Greenhouse for well over ten years now, where my illustrated advertisements have been appearing in local newspapers. Of course, I've been a florist there since I was a kid, because it is owned by my family, and it is my primary job while I concentrate on my artwork in the off-season. 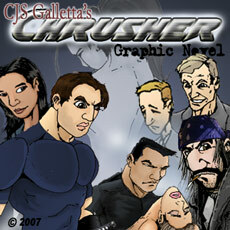 Towner and Chrusher Comics are both hosted on ComicGenesis, a free webhosting and site automation service for webcomics. 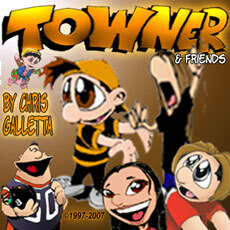 Towner and Crusher Comics - All artwork & original ideas (unless otherwise noted) copyright © 1988-2007 Christopher Galletta Stevens. Please ask permission before using any of the artwork on this website, although you may link to it without permission. All original artwork, intellectual properties, characters, stories, names, and ideas on this website are created and owned by Christopher Galletta Stevens and are protected under copyright laws as such. Artist is seeking publication and/or syndication of any of the projects displayed on this website, and any other project offers are welcome, but stealing or defacing my comics without expressed written permission is not. Please consider donations or buying merchandise, as they are essential for the survival of un-syndicated cartoonists, including this one. Seeking employment as a commercial artist, graphic designer, computer colorist, freelance illustrator, and/or cartoonist. Contact me with offers.